From the top of the steps next to the M&S building there's a nice view over the reconstructed Shambles, now a key feature in the city centre's reinvented 'medieval quarter'. I suppose dismantling the pubs, moving them from their original site and rebuilding them here was the best solution under the circumstances - the destruction of Manchester's medieval district commenced in the Victorian era, helped along by World War 2 bombing and finished off by post-war development. Dear Aidan, I much enjoyed your latest article on the centre of Manchester. The panoramic photograph of the Mitre Hotel,Shambles and Corn Exchange was most eyecatching and reminded me, very much, of a Lowry painting. There will still be a few people around, perhaps even reading this page, who remember this area pre-1940. Just down from here stood the Victoria Buildings, a magnificent Victorian arcade, bigger than the Corn Exchange or Barton Arcade, with a hotel, shops, offices and a magnificent glass roof. If this were still standing today, it would be a major attraction, like a similar one in Leeds. The Victoria Buildings were damaged by fire bombing during the Blitz 59 years ago. The Shambles originally stood on the corner of Victoria Street, opposite the Victoria Buildings - Victoria Street ran from St Mary's Gate down to the bottom of Cateaton Street, where the statue of Oliver Cromwell once stood. On the other side of the Shambles was the Market Place, overlooked by the Kardomah Cafe. There was a clear view up to the tower of the Royal Exchange. I wasn't around in 1939, so how do I know all this? Because I've looked at the pictures in the Central Library, and in "Our Blitz". 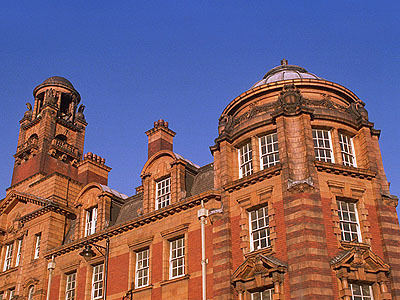 Most people however will be unaware of the existence of the Victoria Buildings and other examples of Manchester's lost splendours - maybe I ought to compile a book of this title - what do you think? Manchester is a story of destruction, re-construction and re-construction again. Unlike Buxton or Salzburg or Krakow, much of the Manchester which survived from other eras up till quite recently has been lost, and continues to be lost. 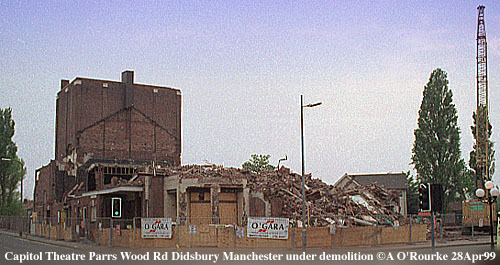 Only yesterday I was shocked to find that Salford's Rialto cinema, on the corner of Bury New Road and Cheetham St West, had been reduced to a pile of rubble - demolished to make way for another McDonald's drive-thru. Not that I've got anything against McDonald's - it's just very painful to see another landmark, another piece of peoples lives, another tile in the mosaic of Manchester - needlessly destroyed, and before I'd got round to taking a photo of it. 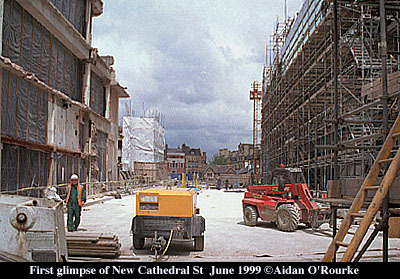 Anyhow let's turn back to the present, and walk down New Cathedral Street - Manchester's newest thoroughfare - it runs from the reconstructed Shambles, next to the Cathedral, to St Ann's Square, with St Ann's Church standing at the far end. It's difficult to comment on New Cathedral Street as it's not finished yet, but at the moment I find it empty, slightly surreal, sort of location, and not the sort of place I want to linger. The hi-tech glass exterior of M&S is impressive, but doesn't ooze much charm. On the other side of the wooden fence, which now displays an impressive set of photos illustrating the rebuilding of Manchester city centre, is the Shambles West construction site, where more building work will begin shortly. It's a relief to have this area opened up again - As a child I remember the large grassed-over triangle here, site of the blitzed Victoria Buildings. This area was overlooked by some old but fully renovatable hotel buildings on the River Irwell side. They were torn down to make way for the large concrete construction from where I took the photo below. Pity we can't have a park here, but no, economics dictates this area has to be built on, and no doubt it will be another mega-excercise in computer-generated, brushed steel, plate glass, hi-tech, more-like-an-airport-than-an-airport, millennium-compliant architecture. Architects have a difficult job nowadays - they're constrained on all sides - by cost limitations, by building regulations, by the expectations of developers, councillors, the general public, by the expectations of their peers. Many of today's buildings are as sterile as the computer simulations made to illustrate how they're going to look. At least the Piccadilly Plaza, a prime example of post-war modernist architecture, and disliked by a large number of people, was bold. Most buildings constructed today, though well-built, seem very bland, and simply don't have the, character and "wackiness" of many older, and a few newer buildings. I still have an uncomfortable feeling when I look around at the transformation of the city, which has happened because of a devastating man-made explosion. The bombers are living in freedom just a short plane or boat ride from here and have probably been watching the news from Manchester on the tv. There are some who say the bomb was the best thing to happen to Manchester. There's nothing like a good bomb, or as Liverpool discovered, a good riot, to attract government attention and financial support. 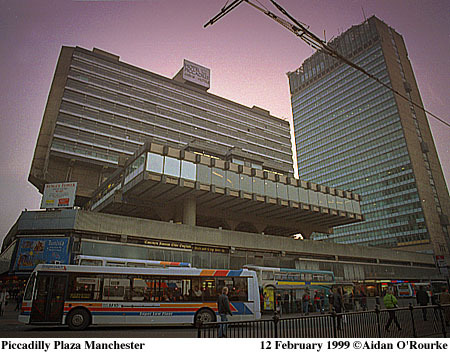 I'm nagged by a suspicion that perhaps the bombers might have thought, in a perverse sort of way, that by blasting the Arndale Centre, they were doing Manchester a favour, as well as helping to oust the British from Ireland. But if the detonator had gone off prematurely - it's happened many times to IRA amateur bomb-makers in the past - it might have killed hundreds and maimed thousands more. 200 innocent members of the public - men, women and quite a few children - suffered cuts by flying glass and other injuries, some serious. It was outrageous that a tiny group of violent political fanatics were able to enter our city and cause such devastation and near-carnage. It's even more of a scandal that those responsible haven't been found and convicted. Earlier this year, the Manchester Evening News printed the name of a prime suspect, and challenged the police to question him. As expected, the police didn't take up the challenge. The reason, as I understand it, is because there isn't enough evidence to secure a conviction. However, the police were reportedly annoyed that a local newspaper had publicised information which wouldn't normally be released to the public. Ironically, an MEN journalist, Steve Panter, was arrested last week in connection with the MEN's story, but released later without charge. It's also a funny co-incidence that the new city centre was opened to the public just as the new Northern Ireland Assembly became a reality. The terrorists thought that the bomb would have forced the British government to abandon Northern Ireland, bringing about the forced merger of the two parts of Ireland. Instead, Northern Ireland still exists, but on a new basis, still part of the UK, and with a grand coalition government representing all communities. New institutions provide for co-operation with the Republic, which, with the support of 95 per cent of its citizens, has reduced its constitutional claim on the territory of Northern Ireland to an aspiration towards unity at some time in the future. I'm going to stick my neck out again and say that we ought to be rebuilding replicas of lost buildings, just like they're doing in Dresden. They could have done it here in Manchester's city centre - keeping the Shambles in in its old location, rebuilding the Victoria Buildings and restoring the old street layout. Dear Aidan, I just read your excellent newsletter about the new Manchester city centre. Impractical, horrendously expensive, backward-looking, maybe, but the result would have been unique and I'm sure, very popular with the general public. 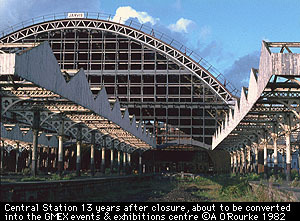 Once upon a time people laughed when it was suggested that old railway stations, goods yards, warehouses and docks could be restored and turned into tourist attractions. Maybe in the future, buildings now demolished will arise again, phoenix-like, helping to revive the spirit of Manchester's past and preserve it for the future. I have a list of candidates, e-mail me if you're interested. Returning from the land of make believe, we've now arrived at the street known as St Mary's Gate, at the entrance to St Ann's Square, where I captured my first QTVR panorama back in June 1997 - It's interesting to compare it with what's there now, and I hope to QTVR it again in another couple of years or so, when the completed Shambles West looms up on this corner (lower left behind the white fence). I wonder what this scene will look like then, and whether there will be a fourth curved corner to complement the others. So this is the new city centre - at least as much as has been built so far. It's very good in some ways, but very disappointing in others. And it's a sad fact that while intense reconstruction continues here, Manchester's assets outside the redeveopment area are being neglected and even destroyed. I feel sad and angry whenever I pass that amazing palace of dreams, the Old Fire Station on London Road, and see it standing empty, run-down and forgotten, while just up the street, millions are spent on the construction of a multi-storey car park that looks like a giant fan heater. 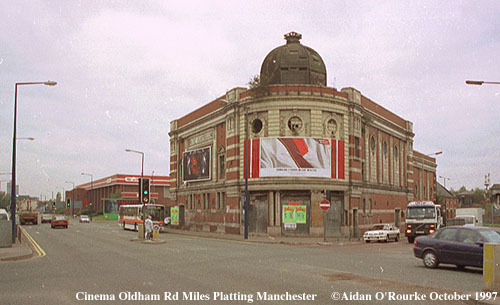 And further out in the suburbs, three of Manchester's old cinemas have been destroyed during the three years I've been doing Eyewitness in Manchester - the Playhouse Theatre Miles Platting, the former Capitol Theatre in Didsbury and now the Rialto on Bury New Road, Salford. Walkden Town Hall now only exists in peoples memories and on photographs. At this rate, there'll be precious little remaining of Manchester's heritage in fifty years, and the city will appear increasingly bland and nondescript - this is already happening today. I wonder what the new city centre will look like in fifty years? Keep reading Eyewitness in Manchester and I'll give my views then! Piccadilly is next on Manchester City Council's makeover list - they've approved their own plans for a new office building on the Portland Street end, with an outlandish and gimmicky landscaping plan on the rest of the site, and are hoping to start work this month. But they may find that their plans are frustrated. More on this in a future Eyewitness in Manchester Newsletter, or e-mail me if you'd like to know more.